This 2 Megapixel Dome Camera System features Sixteen 2MP weather proof dome cameras that provide true 1080p video resolution. 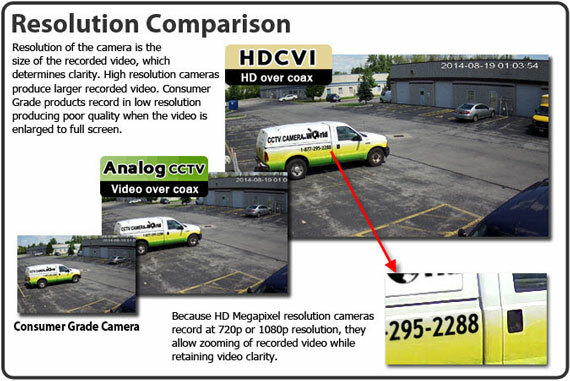 These cameras paired with the HDCVI DVR record in HD 1080p (1920x1080 pixels). Equipped with 12 high-intensity infrared LEDs, these cameras give you 50ft of night vision in darkness. The 3.6mm fixed lens has an 80&deg; angle of view allowing you to see a large area as well as detailed objects such as facial detail in the area up to 25ft away, day or night. The cameras are made of vandal proof and weather proof plastic casing. They can withstand the outdoor elements as well as tampering. The power pigtail passes through the mounting bracket to prevent people from cutting or damaging wiring. The 16 channel DVR included with this HDCVI system has multiple recording settings, including motion detection, continuous 24/7 recording, and schedule day/time based recording. It also features auto-overwrite, which means when the hard drive space is full it will start recording over the oldest footage to recycle video storage. 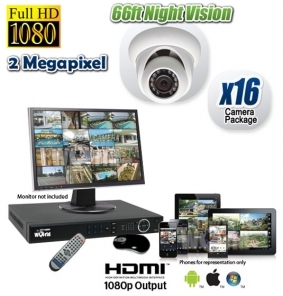 The DVR has a long list of additional features listed below and in its own product description. You can review the DVR description by clicking on its link in the What's Included section.